"There is to be seen at the present time in Marshall Street, opposite the Boston Stone, the ancient eighteenth century building which was formerly the home of Ebenezer Hancock, a younger brother of John Hancock, the patriot. Through the latter's influence while President of the Continental Congress in Philadelphia, Ebenezer Hancock was appointed in 1776 Deputy Paymaster-General of the Continental Army. This appointment made his home an important place during the Revolution for disbursement of money to the troops. Ebenezer Hancock, however, left the house many years before his death in 1819, and by the year 1789 it had become the property of Ebenezer Frothingham, a china and glass merchant, who had his store in the first story. 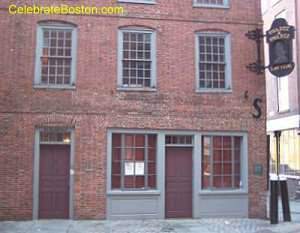 In 1798, Benjamin Fuller, a shoe dealer, also had a shop in the building, and he in turn was followed about the year 1821 by William H. Learnard, who continued the shoe business here until his death in 1886." A shoe store operated in the first floor shop until 1963, and today the structure is used as an office building. John Hancock's house was located next to the State House, and was torn down in 1863.